Aside from coloured vinyl, picture discs and 10"/12" singles, one of the marketing techniques invented when single sales were king was the release of double 'AA' sided singles. Instead of the usual 'A' side backed by an obscure (or even familiar) 'B' side, casual record buyers and avid fans were treated to a double whammy making such releases attractive, particularly if they were following successful lead singles in promoting healthy album sales. 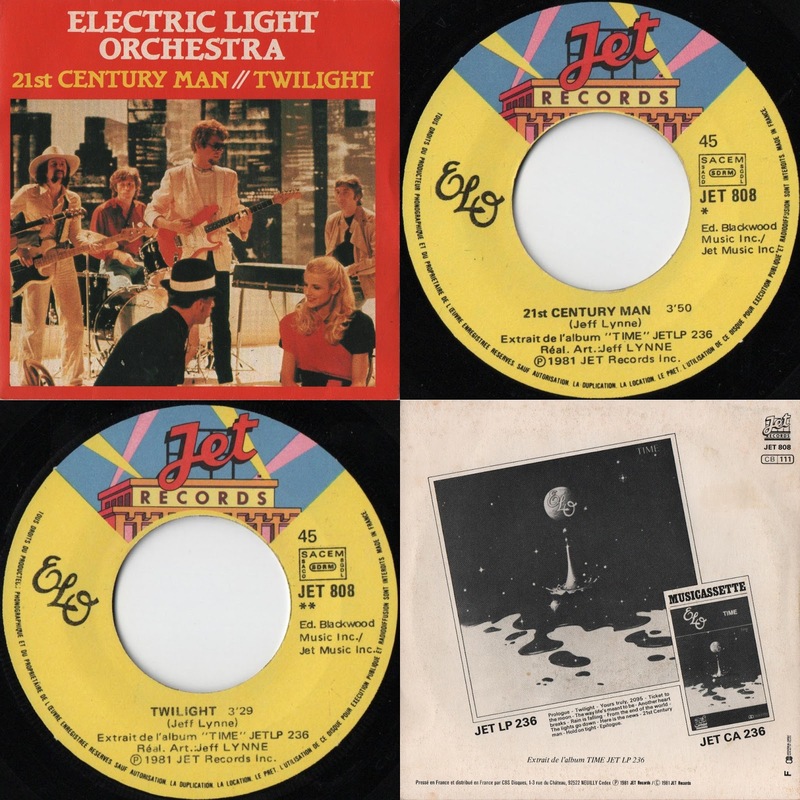 It therefore came as no surprise to see Jet Records issue two 'AA' side singles in the UK when ELO were at their commercial peak. Released as the fourth single from ELO's first UK #1 LP "Discovery" following the Top 10 trio of "Shine A Little Love" b/w "Jungle" (SJET144), "The Diary Of Horace Wimp" b/w "Down Home Town" (JET150) and "Don't Bring Me Down" b/w "Dreaming Of 4000" (JET153), the policy worked when "Confusion" and "Last Train To London" (JET166) were twinned together to peak at #8, confirming ELO as one of the biggest selling artistes of 1979, even challenging the supremacy of ABBA. ELO's second 'AA' single came along following in the wake of their second #1 UK album "Time" in late 1981 in slightly different circumstances. Lead single "Hold On Tight" b/w "When Time Stood Still" (JET7011) was a smash hit peaking at #4 thanks partly to its then budget busting promo video. Both record company and fans both expected second single "Twilight" (JET7015) to also do well but were disappointed when it stalled at #30 despite being backed with the previously unreleased "Julie Don't Live Here". 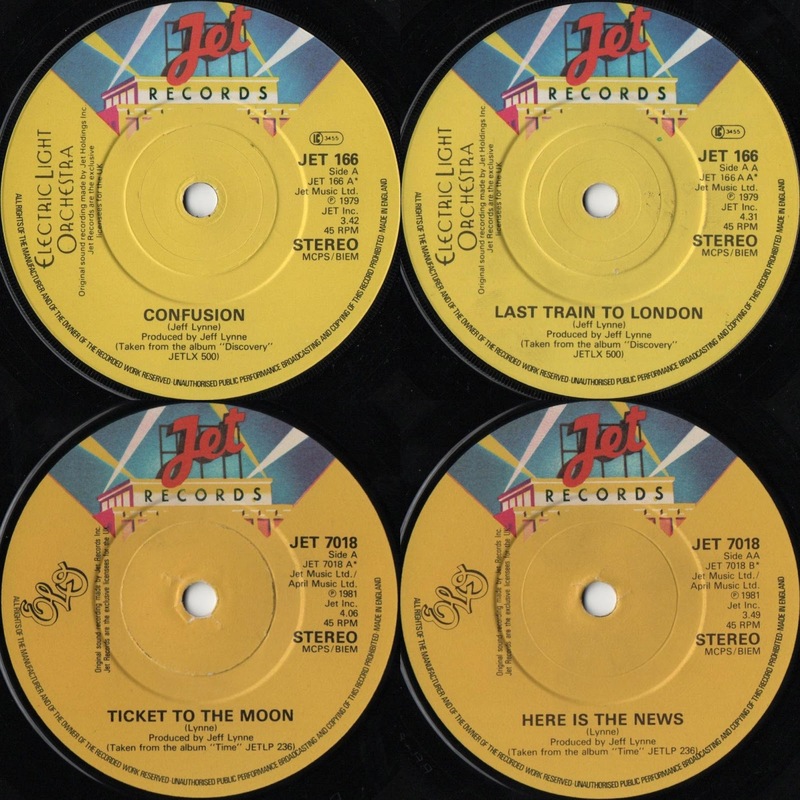 Jet duly rolled out "Ticket To The Moon" and "Here Is The News" (JET7018) as ELO's second 'AA' single (also as a highly desirable 12" picture disc), resulting in a significantly better chart placing of #24. 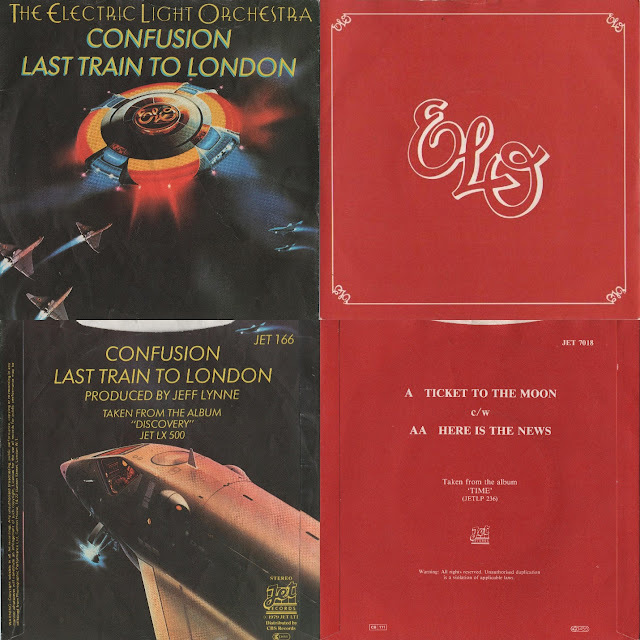 Fourth single "The Way It's Meant To Be" b/w "Wishing" (JET7021) sadly failed to chart signalling the ebbing of ELO's stellar UK singles career. Interestingly, "21st Century Man" and "Twilight" (JET808) were also paired together in France. Although not specifically described a 'AA' single on the sleeve or label, the release is essentially that although the run-out groove for "Twilight" does state "JET 808 B". One can only wonder what might have happened if "21st Century Man" had been released as a single in the UK, particularly as it is still regarded by many as Jeff Lynne's poignant tribute to John Lennon following his tragic death in November 1980. Keith, you are doing a great job. Its too bad that others in the "ELO" community do not recognize this and give credit where credit is due. You would never find this type of information on Jeff Lynne's facebook page or his website. Seems to me that his staff doesnt care to educate his fans. And speaking of giving credit where credit is due...how about Jeff's induction speech at the Rock and Roll Hall of Fame? He never once thanked his fans or fellow band mates. And where were Richard Tandy and Bev Bevan? And why wasnt Roy Wood allowed to perform with them? Is it because of his management or some legal issue from years ago? I know I am not the only one who feels so disappointed about this whole matter. If I were Jeff Lynne, I might reconsider changing the way things are being handled with his staff and websites before he starts losing too many fans. I like your homepage. You placed many topics for the collector’s, as we from Face The Music Germany, in particular in our FTM Newsletter (in German AND in English language) released over the years. 21st Century man was the A Side, it was marked with one *, and Twilight has two ** on the label. The French Hold On Tight was also marked with one * on the A and two ** on the B-side When Time Stood Still. So am pretty sure that 21st Century Man/Twilight is not a double A-Side (even an inofficial). In 1976 France released Waterfall/Strange Magic (credited with 1 and 2) so it was not really a surprise that CBS France sometimes deviated from the “official” single A-sides. UK Colored Vinyl: In 1978 “Out Of The Blue” were released in blue vinyl to push it in the charts again. The coloured set of “On The Third Day”, “Eldorado”, “Face The Music”, “A New World Record” (and “Out Of The Blue” again) were not released in 1978. The first mention in the press of it, we detect was in May 1979, to support the release of “Discovery” by “making ELO attractive” again. There was no mentioning or ads that the coloured vinyl set was released prior Christmas 78. I hope I could help!